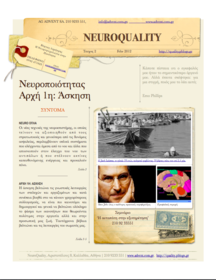 το 2ο τεύχος του Newsletter Neuroquality είναι διαθέσιμο. Press the icon to download the Neuroquality newsletter. NeuroQuality is a new field of Quality Management that applies the scientific discoveries, in relation to the Human Brain, to methods and principles of TQM and in Quality Management in general. Researchers use technologies such as functional magnetic resonance imaging (fMRI) to measure changes in activity in parts of the brain, electroencephalography (EEG) to measure activity in specific regional spectra of the brain response, and/or sensors to measure changes in one's physiological state (heart rate, respiratory rate, galvanic skin response) to learn why consumers make the decisions they do, and what part of the brain is telling them to do it. Quality professionals will use neuroQuality to better measure a customer's preference, as the verbal response given to the question, "Do you like this product?" may not always be the true answer due to cognitive bias. This knowledge will help quality professionals to create products and services designed more effectively and Quality initiatives focused more on the brain's response. 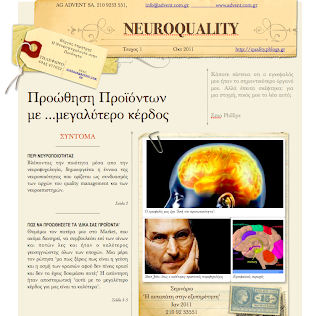 The word "neuroQuality" was coined by Vergas Dimitris in 2010.